If you were to ask me what the best thing about my job is, I would definitely say it's getting to think about British art in its broadest sense and then present it in a variety of international contexts. Over the last two years, I’ve been working on a new show, Picasso and Modern British Art, a major exhibition of works by Picasso – the towering genius of modern art – and seven leading British artists. With my colleagues Chris Stephens, James Beechey and Christopher Green, we’ve been tracing Picasso’s lifelong connection and affection for this country and exploring how British artists responded to Picasso’s innovations from different periods. Picasso himself visited Britain twice, first in 1919 with the Ballets Russes in Covent Garden, and again in 1950 as a member of the Communist Party for the World Peace Congress in Sheffield. But the story of his works is much wider, taking us on a journey from the first fiercely-debated appearances of Picasso’s work before the First World War to the British exhibitions of Guernica in 1939, and culminating in Picasso’s ground-breaking solo exhibition at the (then) Tate Gallery in 1960. We’re showing how British artists responded to Picasso’s innovations from different periods, specifically: Duncan Grant, Wyndham Lewis, Ben Nicholson, Henry Moore, Francis Bacon, Graham Sutherland and David Hockney. Some of these artists knew Picasso well and appreciated his work long before it was understood elsewhere; others participated in the same exhibitions, and some saw and responded to it in reproduction. Whatever their story, each of these artists took something from Picasso as part of the development of their own art. 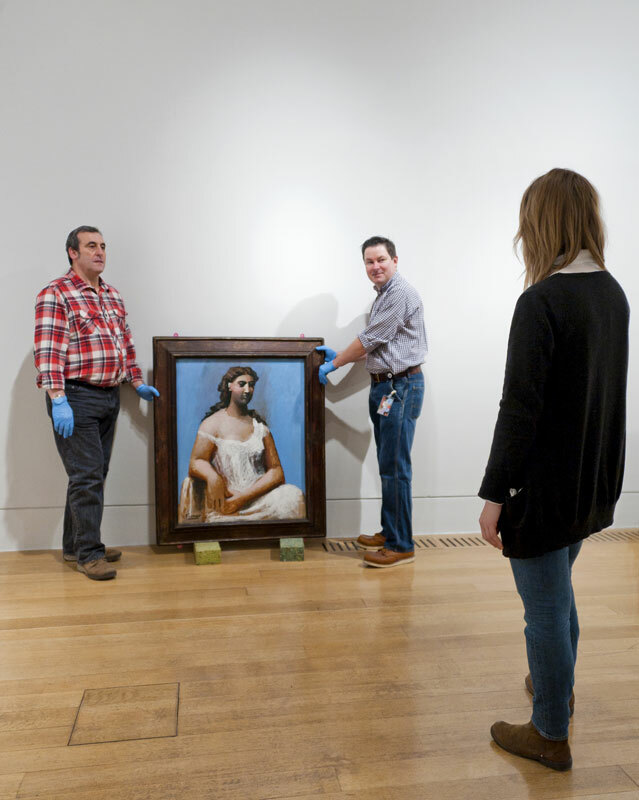 In researching works that demonstrate Picasso’s strong British connections, tracking them down from around the world and securing their loan for the exhibition, we’ve found some fascinating stories, unearthed some mysteries, and most of all, brought together a remarkable selection of works from Picasso’s career. Some works are iconic, others may be less well-known, but all allow us to trace his presence and influence in Britain. I like to think that in many ways the discovery of Picasso in this country runs parallel to the story of modern art and the development of modernism in Britain, and the exhibition charts how British taste for his work grew from a small, acquired elite into mainstream culture. Now the research is done, the works are nearly hung, and we are getting close to opening the exhibition on February 15th, I’m really looking forward to unveiling the story of how Picasso’s reputation as a figure of controversy and celebrity developed here, and also to hearing your stories, reminiscences and opinions.